The pair of pine tree branches partially hides the caramelized spears of snow white asparagus, as if this image was deep in the heart of a far-off forest from a Hans Christian Anderson fairy tale. The moment is pristine and clear. A flurry of pine needles off the branch lay alongside the asparagus on one side, while a forest green pool of pine and green asparagus sauce counters the pine needles. They work in unison on this edible canvas. 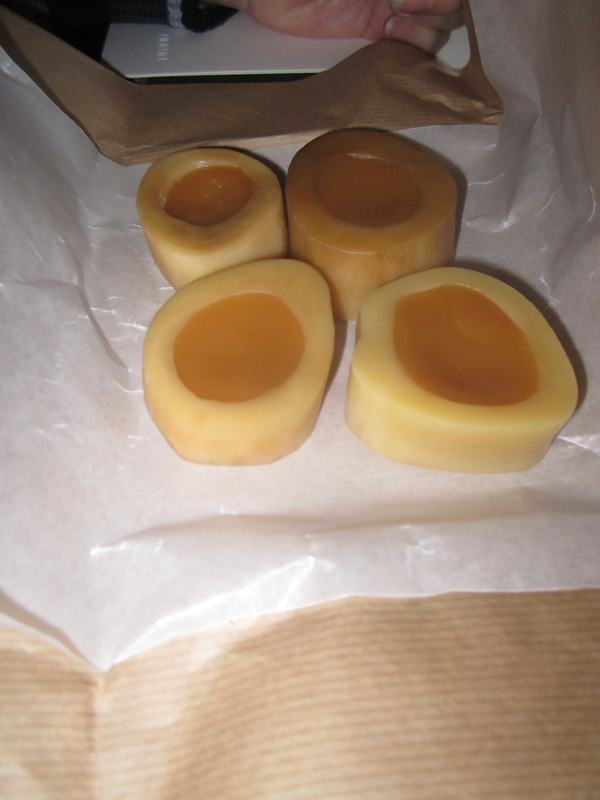 The tender white asparagus is dipped into the sauce, followed by a roll in the needles. 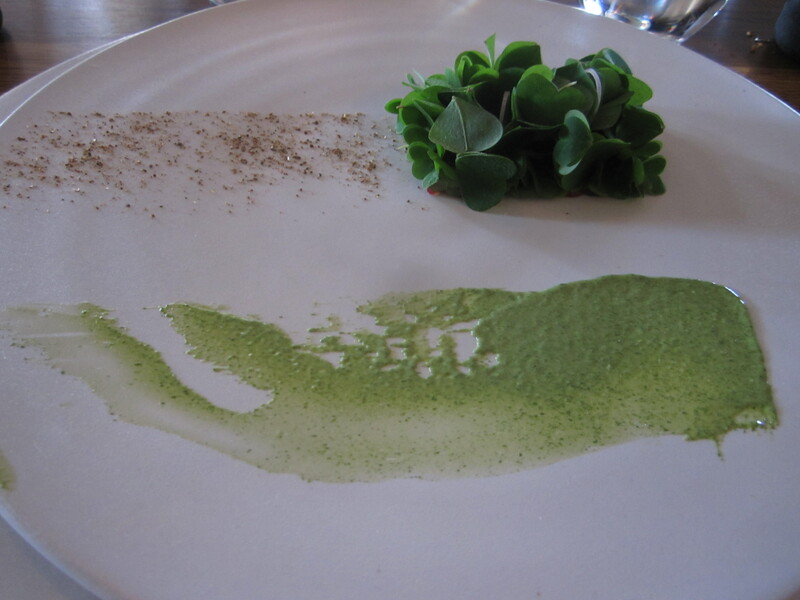 Asparagus and pine is the humble name of the most startlingly simple masterpiece on a 27 dish marathon of masterpieces at Copenhagen’s famed restaurant, Noma. The dish centers on the perfectly, gently charred white asparagus. With its hyper-seasonal and local focus on ingredients that every restaurant opened in the past ten years claims to possess, but that Noma takes to a stratospheric obsessive level, the chef delivering the dish to the table informed us that we will in fact be the final service of white asparagus for the spring-summer white asparagus season. One more day and the asparagus would be merely mortal. The asparagus and pine twist and twirl together in various forms—each alone, each together in the sauce to bathe the lone asparagus. A dollop of crème fraîche is added tableside, the one element of the tableau not related to asparagus nor pine (the white color does not disturb the winter white-green spring theme, however). Pine needles may be one of the more peculiar seasonings you’ll encounter. Basil may conjure images of Tuscan country sides, while pine needles transport you to Christmas. The somewhat minty freshness from the pine nearly numbs the palate initially, like a Szechuan peppercorn is wont to do, then subdues it for the filet-mignon-like, tender, white asparagus to re-capture the focus. Asparagus and pine is a work of art. Noma is, as it has been compared to many times, a ballet, telling a riveting story full of comedy, drama, romance, and grace. It’s never easy to be the best. Nobody likes you, but everybody envies you when you’re number one. It’s even harder to be the best restaurant in the world, because everybody will have a separate opinion as to what constitutes the best restaurant. “Foodies” worldwide will claim that their neighborhood bistro is the world’s best, or that it is absolutely ludicrous that Mugaritz or the French Laundry are not “better” than Noma, as if it’s possible to really say if “Hey, Jude” is the better song than “Let It Be.” At least in sports, the team that wins the Super Bowl or the gold medal is the best. Debates will ensue, but the champion is the champion. Besides, how can Noma really be the best restaurant in the world, as it has been named by the U.K.’s Restaurant Magazine’s World Top 100 list in 2010, 2011, and 2012, if it still has never even received the exalted three Michelin star rating? If elegant formality is the standard operating procedure for Michelin in determining the difference between two star destinations and those who warrant the maximum three, then Noma shouldn’t have and isn’t meant to have three stars. Noma is elegant, and it is indeed formal. It is elegant in a stark, barren form, while being formal with how refined every aspect of the dining experience is. Noma is a whimsical place, with a sense of humor and childhood curiosity that makes dining here actually…fun. 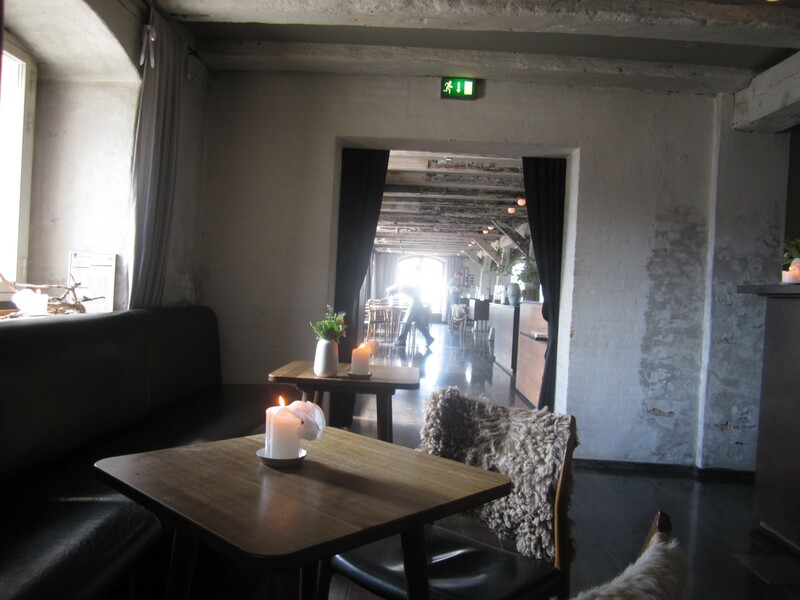 It’s quite a concept to have such an important restaurant in the landscape of worldwide gastronomy and a restaurant where a meal is 1100 Danish Kroner (roughly equivalent to The French Laundry’s $275 USD by comparison) actually allow you to relax, laugh, and feel at home. No pressure, no rigid formality, at least for you the diner. Eat what you want with your hands. The Ritz during Escoffier’s époque this is not. 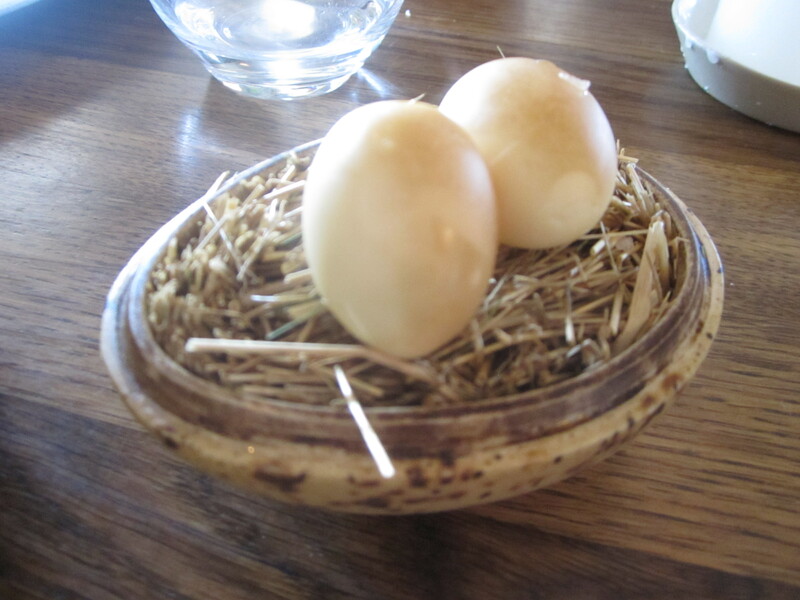 Cutting to the chase, is Noma the best restaurant in the world? Having not dined at every restaurant in the world, I can’t answer that question. However, after four hours of dining at Noma (if it’s even possible to declare this knowing the global hype that surrounds the restaurant), I can clearly say that Noma surpassed my expectations. No restaurant before had achieved the level of culinary artistry, no service as crisp and fluid, no experience as sparkling as that of Noma. Expectations were surpassed, because I had not known that this level could be achieved. The bar has now been raised. Best restaurant in the world or second- or third-best, Noma certainly was the best restaurant meal of my life. Best restaurant in the world or even the fourth-best, Noma brilliantly achieves its mission of innovative cuisine and representing the time and place of the meal. Everyone deserves his own opinion. From this camp, Noma will always have a place in my family’s fondest memories. 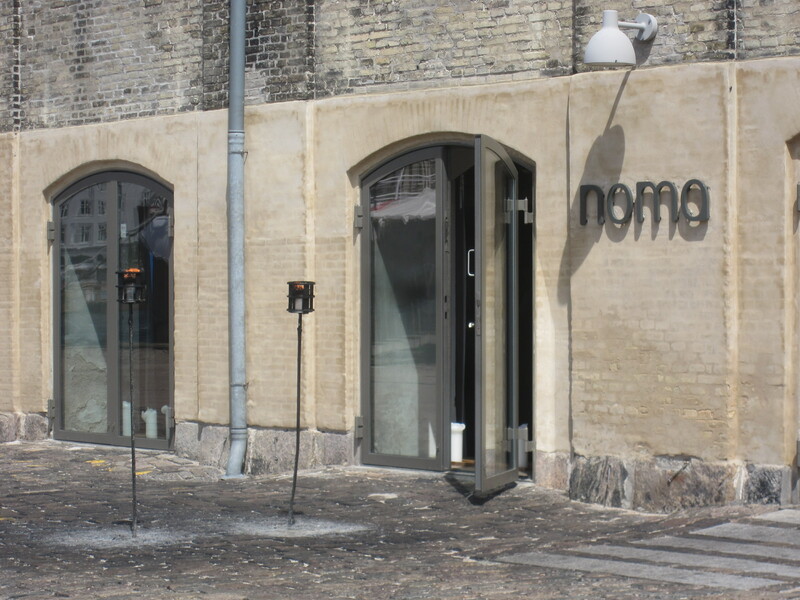 The Noma experience begins three months prior to your targeted month of visiting the restaurant, when all reservations are available online and then scooped up in seconds by millions of dreaming diners worldwide. Persevere and success may follow, as happened at one lucky moment for me after midnight one early morning. 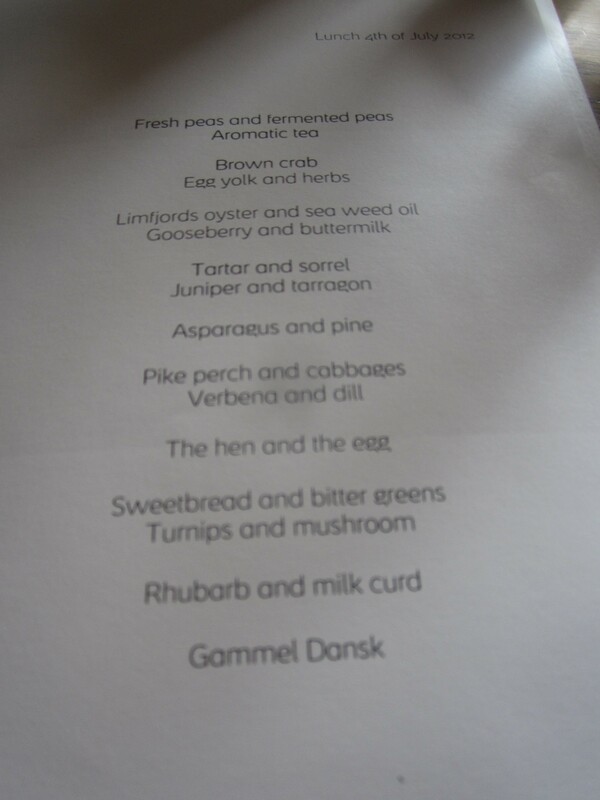 The trip to Scandinavia didn’t exist before the Noma reservation. When that date is set with Noma, somehow a trip will happen. While the rest of my family slept in and stretched, preparing like athletes for the lunch date, my artsy morning at the magnificent NY Carlsberg Glyptotek Museum led me to a panic finding a taxi in time to get to Noma, thanks to Copenhagen’s ever-present bike lanes, which make it impossible for taxis to pull over to pick you up. After working at El Bulli and The French Laundry, quite the formidable duo for the resume, René Redzepi opened Noma in 2004 with co-founder Claus Meyer (now the chef-owner of Copenhagen’s excellent bakery, Meyers Bakery and the restaurant Radio). Redzepi’s rise to power has been well-chronicled, to the point that this year he was named one of the 100 most influential people in the world by Time Magazine, at the age of 34. He is the creator and leading preacher of the “New Nordic” cuisine, focusing on the hyper-local and seasonal ingredients of Denmark and its Nordic brothers. New Nordic cuisine takes the Alice Waters organic, local sensibility to a completely different, reindeer moss- and gooseberry-filled world. The cuisine has become one of the “hot” trends worldwide now; yet it would be completely contradictory to the hyper-local purpose of the cuisine to enjoy that asparagus and pine dish, that so represents this region, in Buenos Aires. Most recently, Redzepi and his kitchen staff took Noma and its dynamic vision of New Nordic cuisine outside of Copenhagen for the first time. The ten day Noma pop up at Claridge’s happened to coincide with the Olympics, pairing the world’s best athletes with the world’s best restaurant. No word yet if Michael Phelps stopped by to sample Noma’s cuisine prior to a race. The idea of a world renowned restaurant popping up in London followed in the footsteps of Thomas Keller’s London pop up at Harrod’s in October 2011. Redzepi still presented the New Nordic cuisine that represents the time and place of Copenhagen, despite being in London. 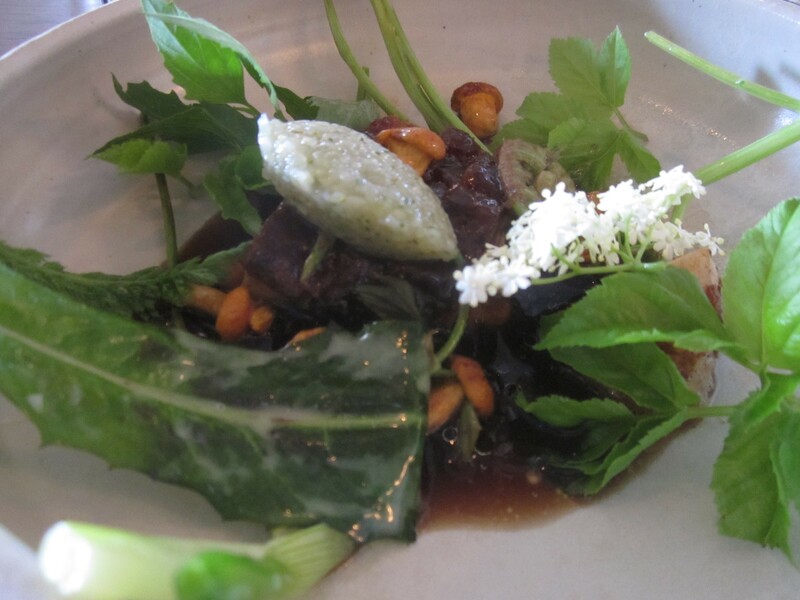 There were ants on the menu, along with the steak tartare with sorrel served at our meal in Copenhagen, but no British standards re-interpreted à la New Nordic. Steak and kidney pie with a reindeer moss crust? Leave that to one of London’s hundreds of gastropubs. 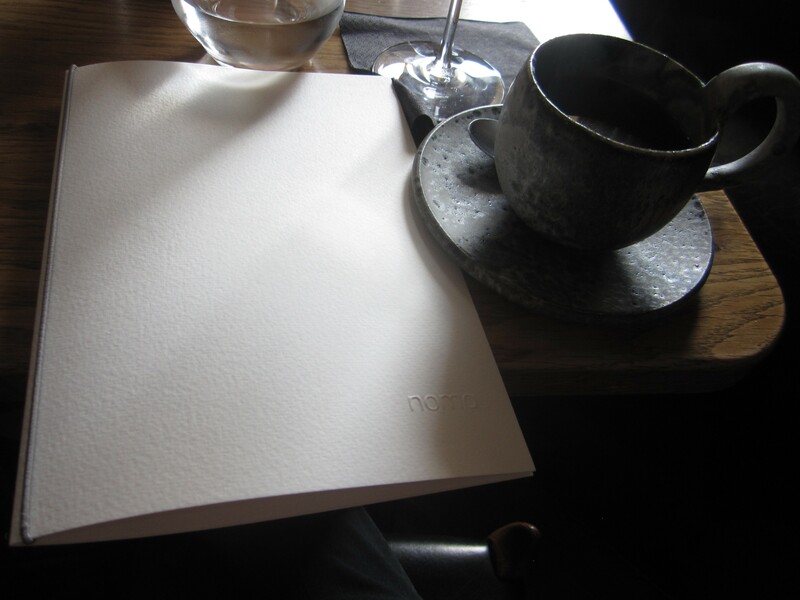 Redzepi’s concept of having the experience at Noma represent a certain time and place is clearly represented by his 2010 cookbook Noma: Time and Place in Nordic Cuisine. 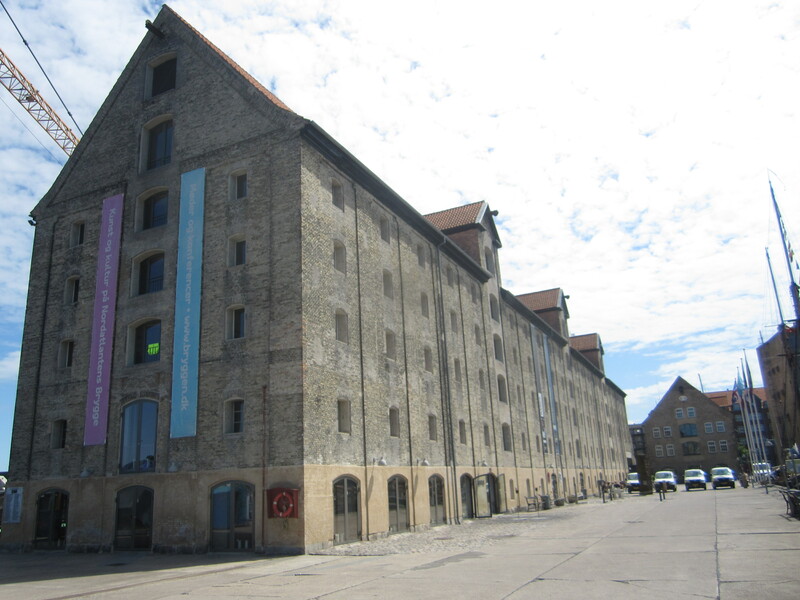 I won’t dare to try any of the recipes in the book, but on this sun-splashed, early July afternoon along the canal in Copenhagen’s North Atlantic House, there was no doubt that the procession of dishes showed when and where we were. The present was crystal clear. After a server kindly asked if we’d like our picture taken outside, we were led inside and welcomed by a line of at least half the service and kitchen staff. The lead server then queried about drinks, a daunting task in order to pace yourself over two dozen tastes and four hours in the middle of the day. Then he asked again about allergies or preferences. Once the formality was quickly done, the starting pistol went off, and away you go. A rapid-fire procession of snacks commenced. 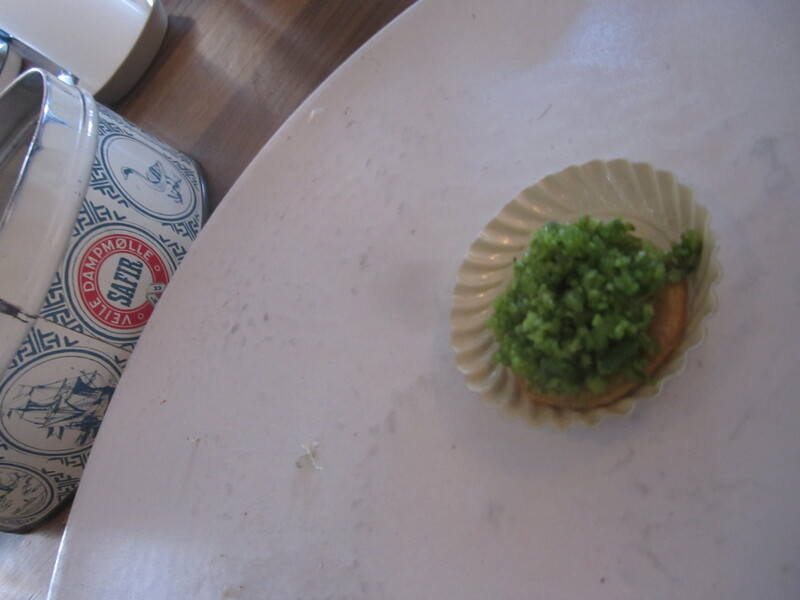 After only a bite or two, the whimsical whirl began that makes Noma truly Noma. 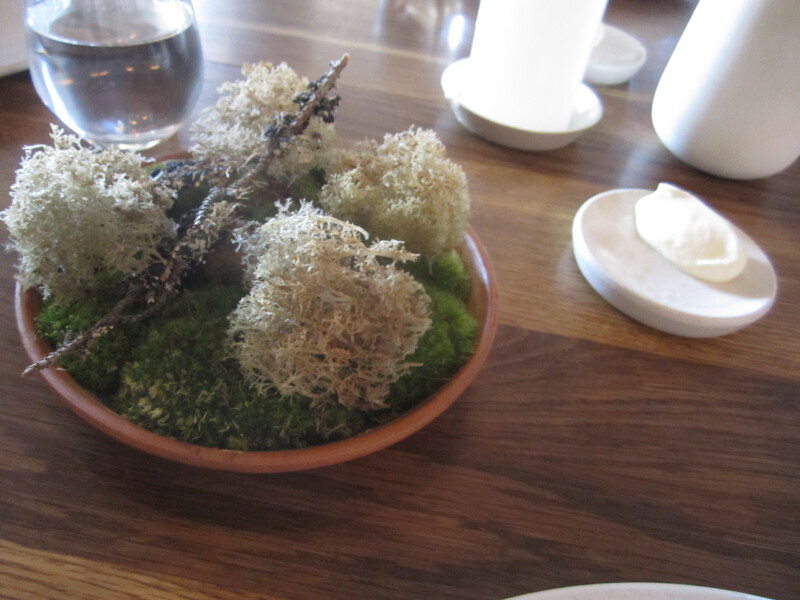 Reindeer moss from Finland dusted with cep powder and deep-fried was the opener, as brittle as thin ice, looking indeed like what might grow on a stump deep in the forest. Then dipped in crème fraîche, which tasted like…crème fraîche, it was a beautiful debut. It’s obviously hard to pick a favorite with stiff competition among two dozen masterpieces, but the second snack gets a vote here for the most impressive from a fascinating taste perspective (which explains why the photographer was distracted and never took a picture of the dish). Crispy pork skin lent its saltiness to a thin slice of black currant jelly for an entrancing, two-bite, two-taste sensation similar to salted caramel, here with the salty pork to the fruity, sweet finish. 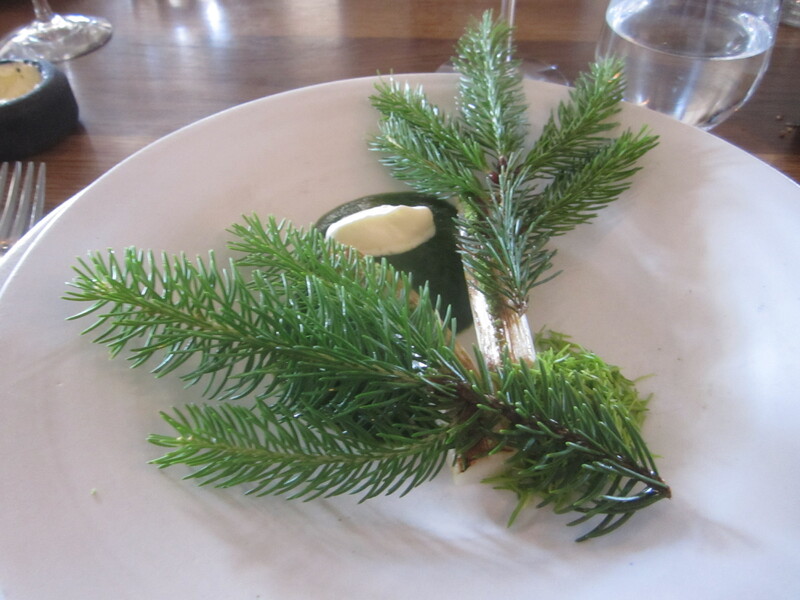 A classic Noma dish, of the many, followed when a server directed our attention to the edible centerpiece with a malt flatbread-stick dusted in juniper powder in disguise as part of the forest landscape. You’ll never look at flowers in the center of the table the same way again. Seafood made an entrance in an impressive way with a plate full of mussel shells with a quartet of “different” edible mussel shells in the mix, pairing fried mussel and celery. The cookie tin arrived, not full of biscotti, but savory cookies similar in texture to shortbread with a cheese taste, covered in rocket and various finely diced stems that looked almost like green caviar. 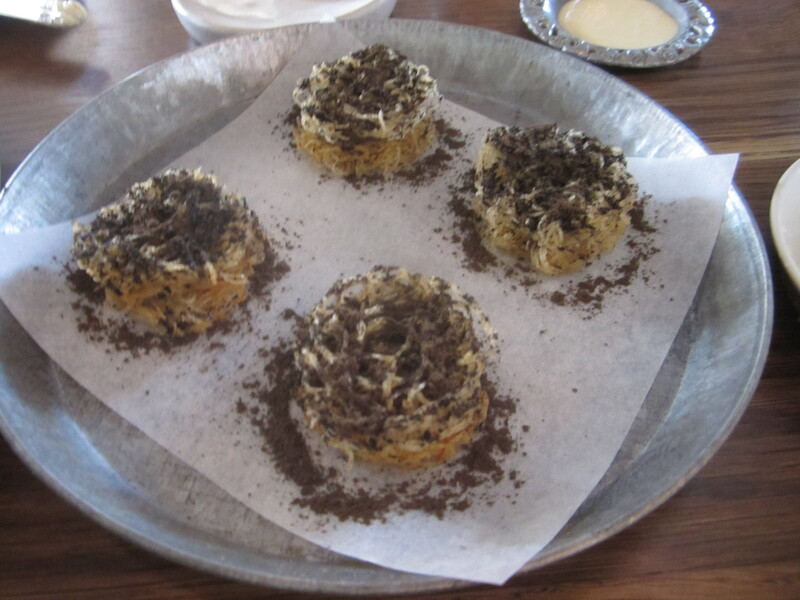 Another tin held more savory cookies, this time with a thrilling combination of smooth chicken liver topped with a cloud of crisp fried potato, that looked not far off from reindeer moss. My Tokyo eating adventures immediately flashed back when the tiny, squirming, petite shrimp arrived in an ice-filled mason jar. Simply dipped still alive in some butter, you’ll wonder why anybody ever eats shrimp not alive and with the head and tail on. Sure, you feel like a bear eating it, but bears must have good taste. Do beware that moving shrimp are indeed…moving. My shrimp had a tendency to freeze and then flinch suddenly. A light-as-air sandwich with rye crisps as the bread looked a bit like a granola bar, filled with a layer of chicken skin and a hefty serving of lumpfish roe, reminding me of a completely re-thought bagel with lox and cream cheese. More chefs should serve chicken skin with rye, a blissful partnership. 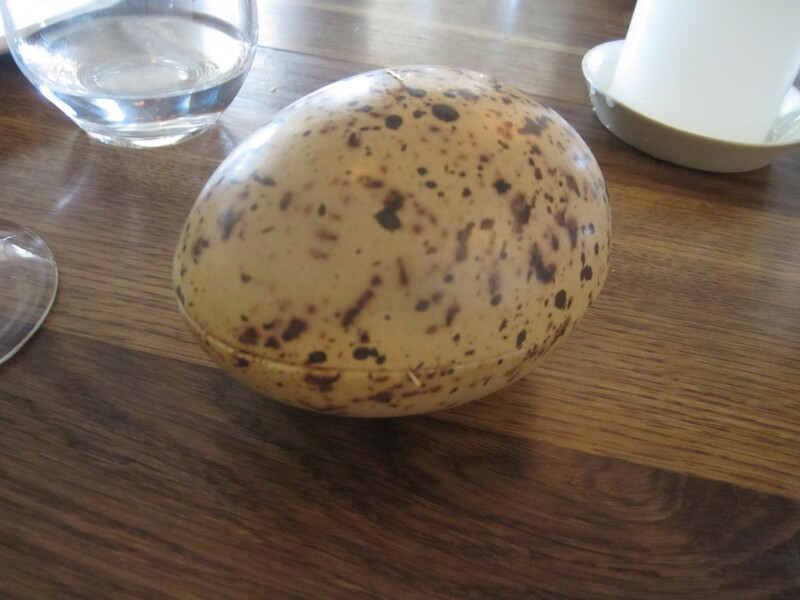 A dinosaur egg held inside two pristine, pickled then poached then smoked, quail eggs with liquid gold yolks, nestled on a bed of smoking hay. If only breakfast could be this therapeutic each morning! 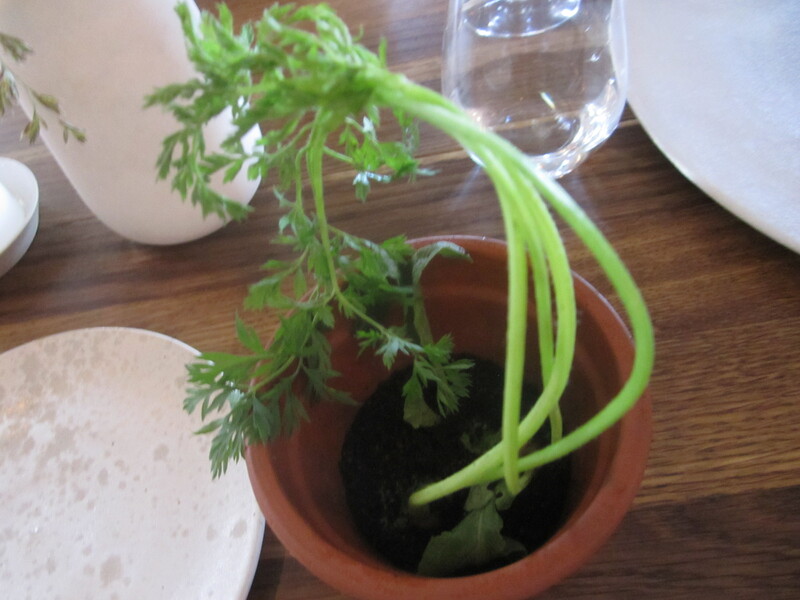 We knew that we were at Noma when the clay pot arrived with soil and some plants. Inside of course were edible soil made of beer, butter, malt, and hazelnut, an herb cream tasting strongly of tarragon, and radishes with stems climbing high out of the pot. Restaurants worldwide have jumped on the edible soil bandwagon. Noma started the idea and still thrives with it. That radish was a lovely radish, but not a life changer like the soil. 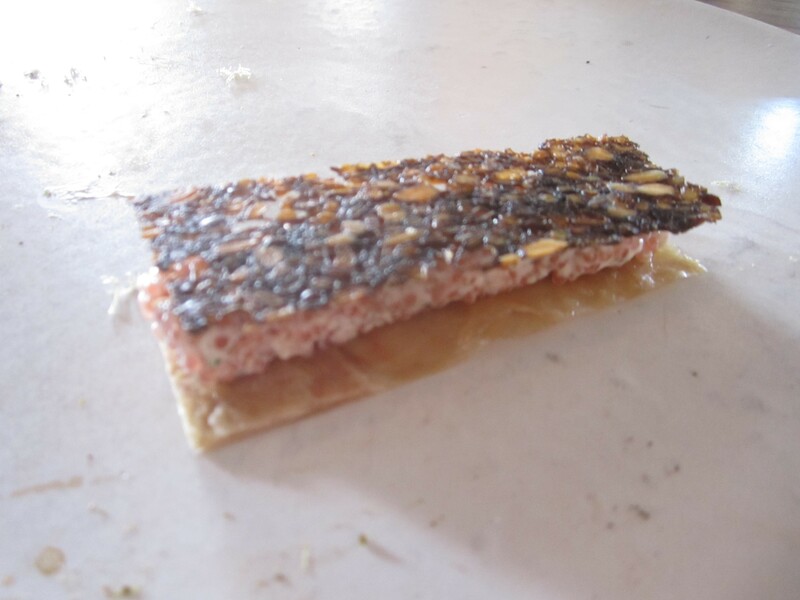 The second-to-last snack was the most aesthetically striking, with the finest of triangular “toasts” creating a sandwich over a medley of herbs and pleasantly fishy, smoked cod roe. Again, more mingling of fish, salt, sweet, smoked, and herbs, for a thousand different directions of tastes that all came together harmoniously in the end. Each ingredient was there for a purpose. The finale snack was the most fun, evoking the childhood of Redzepi with a classic Danish Christmas treat, Æbleskiver. Similar to beignets but less cakey in texture, the doughnuts are usually filled with sweet apple preserves. 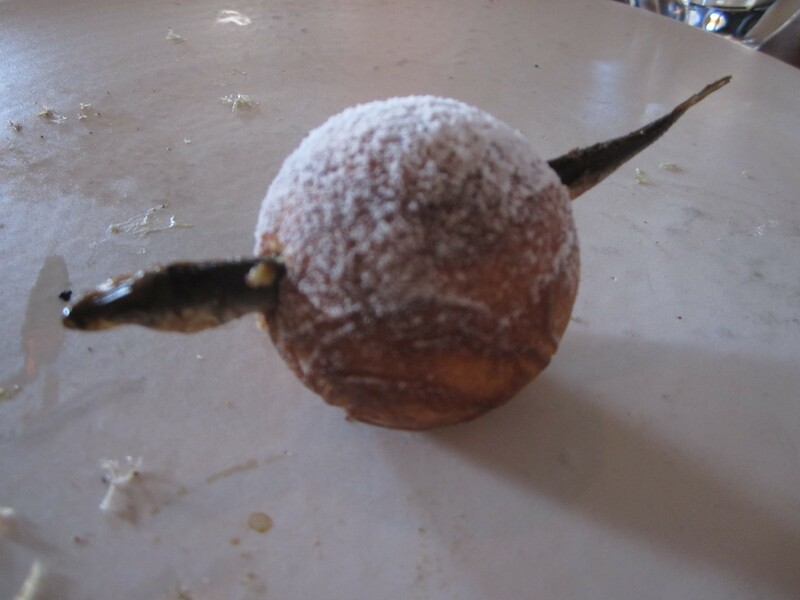 Noma fills them with a sardine-like fish called muikku with the fish head poking out one side and the tail out the other, as if they are wings for the beignet. The center is still slightly undercooked and warm with melted butter, creating a blast of excitement when tasted with the fish. This is a Christmas tradition I should start at home, perfect with egg nog? After the Æbleskiver, it’s halftime of the ball game. Teams go to their locker rooms, fans go to buy more beer, and the cheerleaders perform on the field. Well, it was the same type of intermission feeling between the snacks and the more substantial plates set of the program. As fascinating as the food is, an equally fascinating part of the Noma experience is the brilliantly orchestrated service under the direction of Lau Richter. The style is just as elaborate as service à la Russe, but with much more levity and artistry. The style fits perfectly with the style of the food, adding a jocund tone to the afternoon. The servers and chefs smile, which lets you know it’s o.k. to smile and laugh too. Arriving at Noma, diners are in the serious, must-be-impressed zone, but quickly permitted to be themselves once settled in. Yes, the chefs deliver the plates or rocks or what-not from the kitchen, then stopping to explain in thesis-level detail the dish’s execution, the story of the dish, the story of the ingredients, and sometimes the story of their lives too. 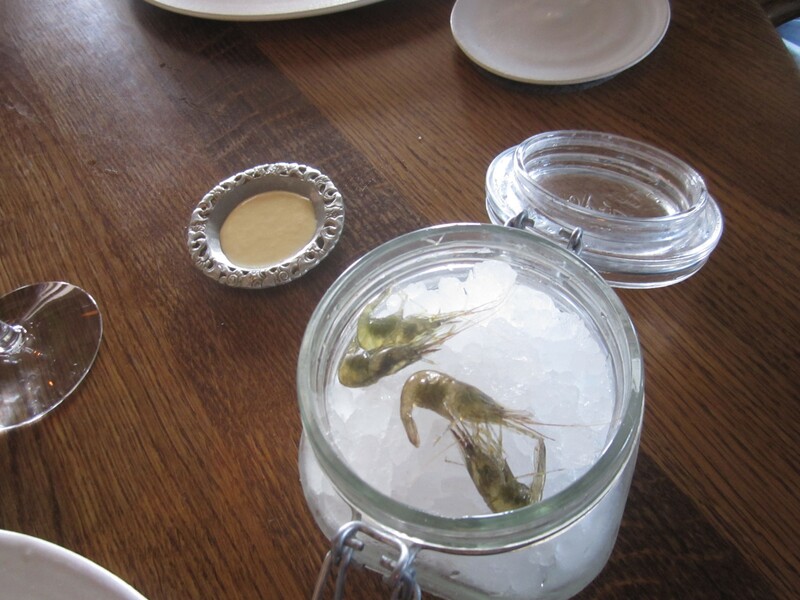 Yes, this is Noma, all about the time and place. 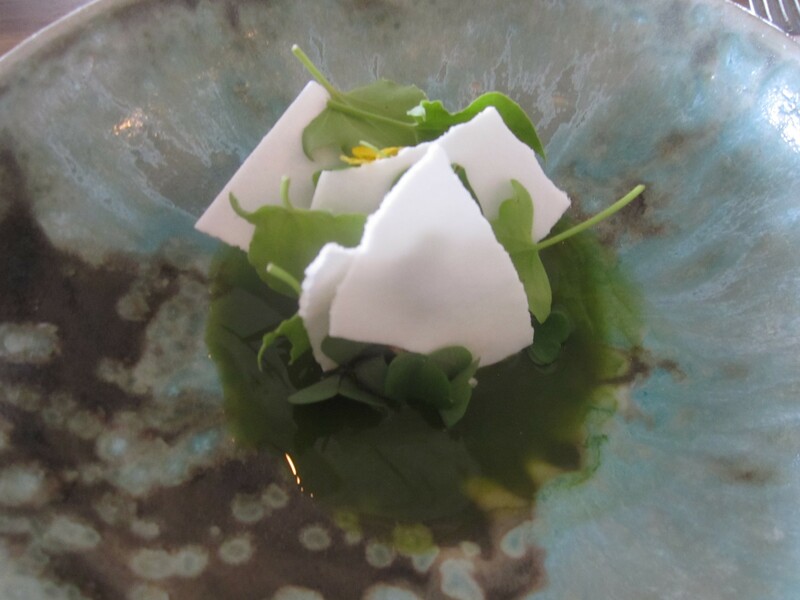 Yet with the flurry of dishes and diligent detail in each dish’s execution and presentation, all you remember are scattered bits and pieces, such as this wood sorrel is from some village 30 miles away or the rhubarb is dehydrated then juiced. One of the most intriguing parts of the service style is how in the snack first-half, the snack comes out two snacks before you are actually meant to eat the snack. So perhaps you’re eating a cookie with chicken liver, with the shrimp on deck on the table already, and then come the rye sandwiches with lumpfish roe. Somebody must always be watching you to have such precise pacing, never rushed, but always energetic, without the feel of Big Brother lurking somewhere. Another technique to take away from the service is how the snacks are presented to various people at the table or in the center. One dish might go in front of me, the next in the center, then the next dish in front of the diner across from me. Whether or not there’s any real guideline to this, I don’t know, but it certainly works. It’s a joy interacting with these young men and women. With over 20 countries represented, over 40 chefs in the kitchen, and at least a dozen servers in the front of the house, the time and place is about more than just what you eat. You eat those snacks with your hands; no silverware is provided until after the intermission. There are no bread plates or other plates. There are no table cloths. This is a feast, so you’re invited to dig in. 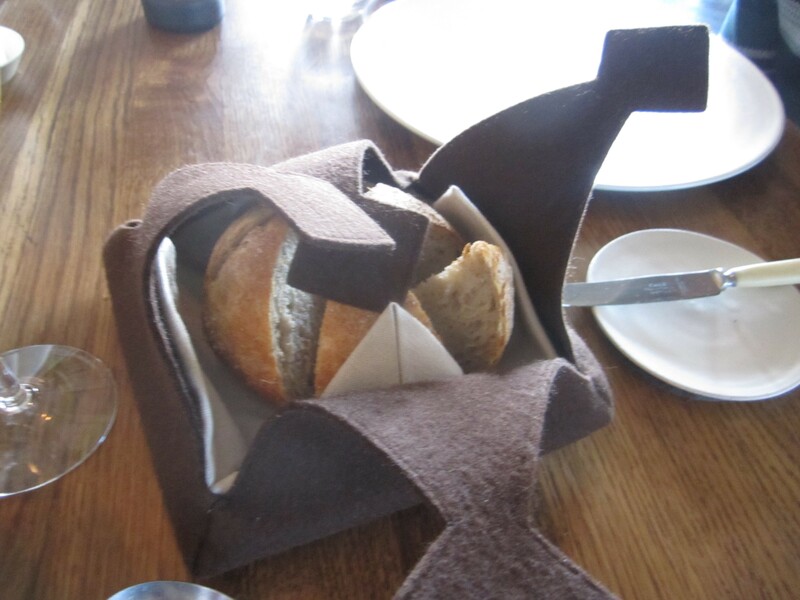 The bread plates arrived with the boule of sourdough bread, quietly resting in a felt fabric parcel. A pair of addicting butters made the bread an entire course or two; one was pork fat topped with diced pork skin, and the other was goat’s milk butter sprinkled with sea salt. With all of these herbs and plants over the course of the meal, it’s o.k. to enjoy the butter with minor guilt. 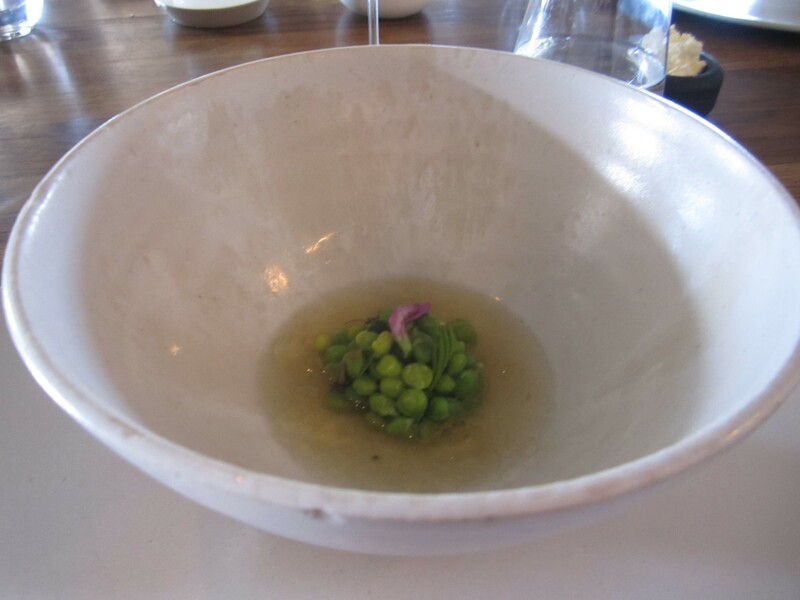 Plates, spoons, and forks arrived with the bowl of fresh peas and fermented peas in an aromatic tea broth topped with an edible flower, a cleansing, meditative way to start the next round. 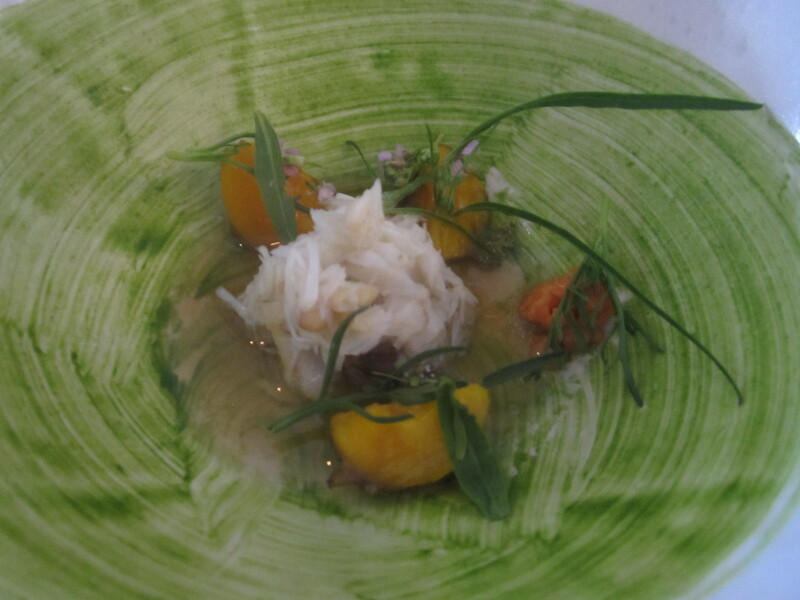 Quickly the peas got overshadowed by the artistry on display with the exceptional brown crab tableau, surrounded by solid egg yolks that looked like ripe yellow peaches at the base of a bowl with a striking sorrel-based sauce smeared around the bowl. If a dish were to be the most photogenic, this would be it. 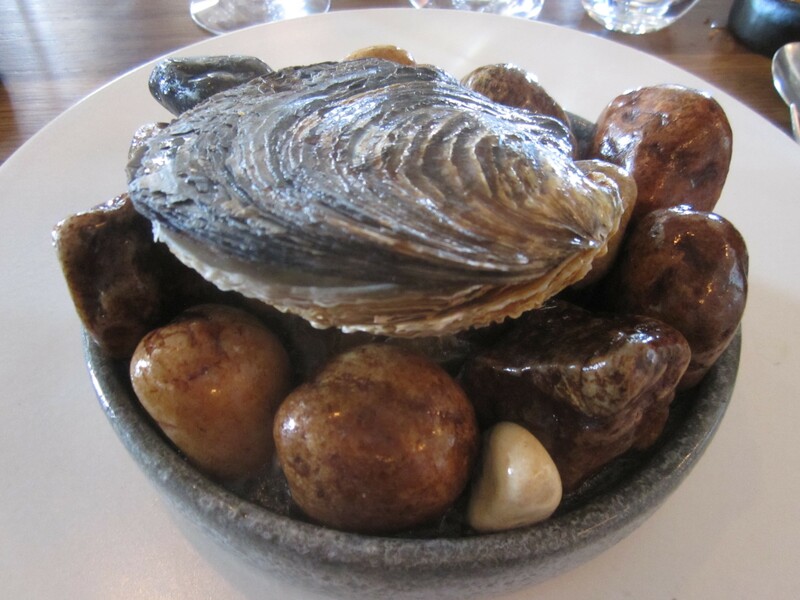 A mammoth, plump oyster from Denmark’s Limfjords continued the seafood-themed plates, with the oysters arriving on piles of stones for quite the natural landscape, making the servers’ biceps look like Popeye’s from carrying these each day. 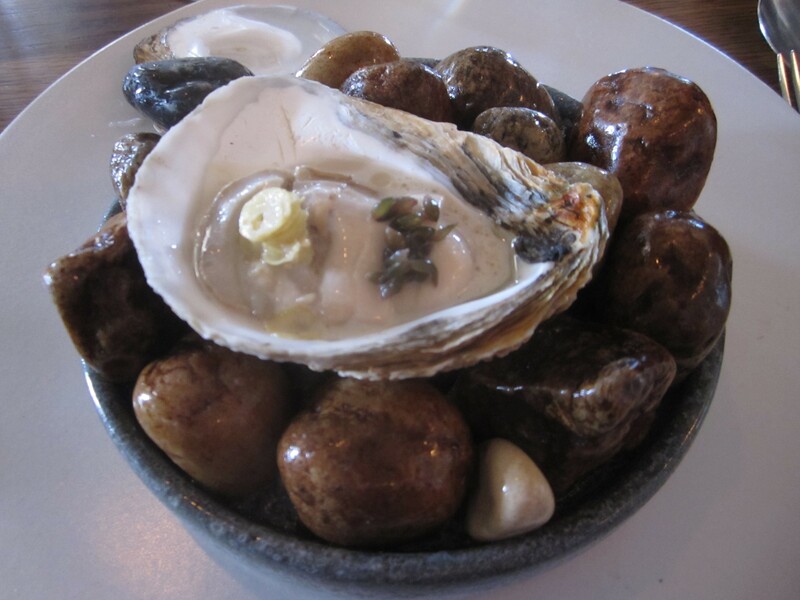 I’ve never found an oyster outside of New Orleans as spectacularly sized or flavorful as this one, singing of the sea, complemented by seaweed oil, gooseberry, and buttermilk. Talk about a flavor shot. The oyster shell was the size of my hand and even smelled of the sea from a prior bath in Danish sea water. 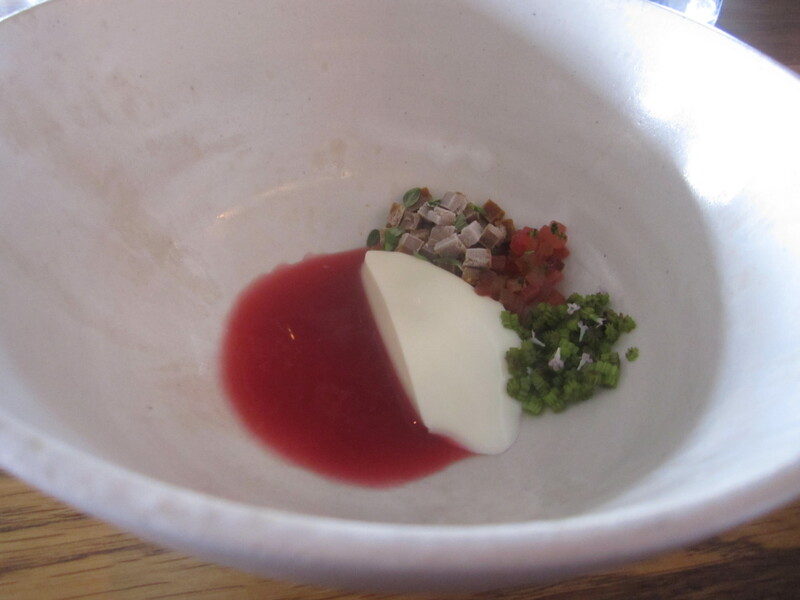 The forks and knives disappeared for the steak tartare, with the rose-colored beef hidden under clover-shaped wood sorrel. With some powdered juniper and a robust smear of tarragon sauce alongside, diners eat this raw meat dish savagely, combining whatever elements together they please. When all are in one bite, the ultimate feeling is reached. 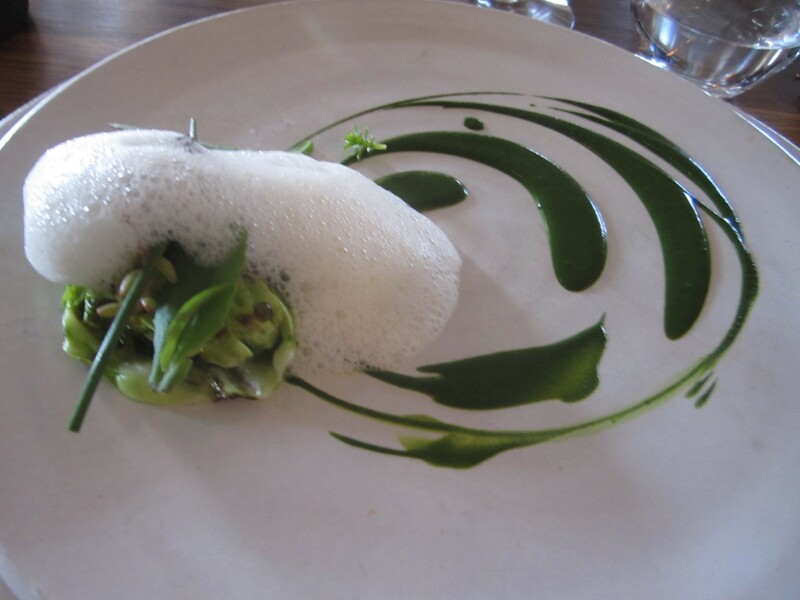 The asparagus and pine followed, then back to fish with the softest of pike perch fillets encased in a foam, a definite nod to the El Bulli days. Verbena and dill perked up the fish, with an assist from the bed of cabbages that were nothing like what you had as cole slaw at lunch today. Right around this time diners start questioning how much more of this unbridled joy you can handle. The wine might start kicking in; the first signs of being full may arrive. Discussions tend to be briefer, and your eyes may wander a bit around the room. It’s time for the hands-on portion of the meal now, with the famed Hen and the Egg. 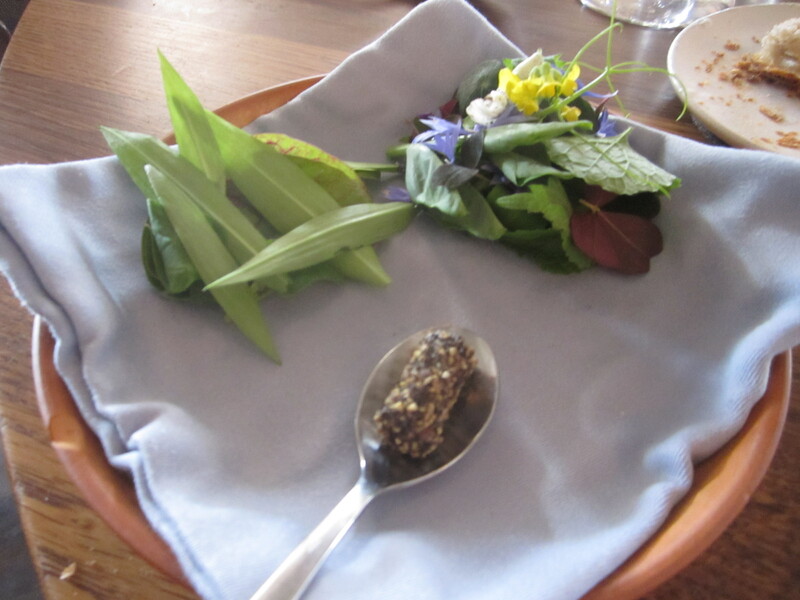 Each diner receives a plate of raw materials—herbs, flowers, and a stick of herb butter. 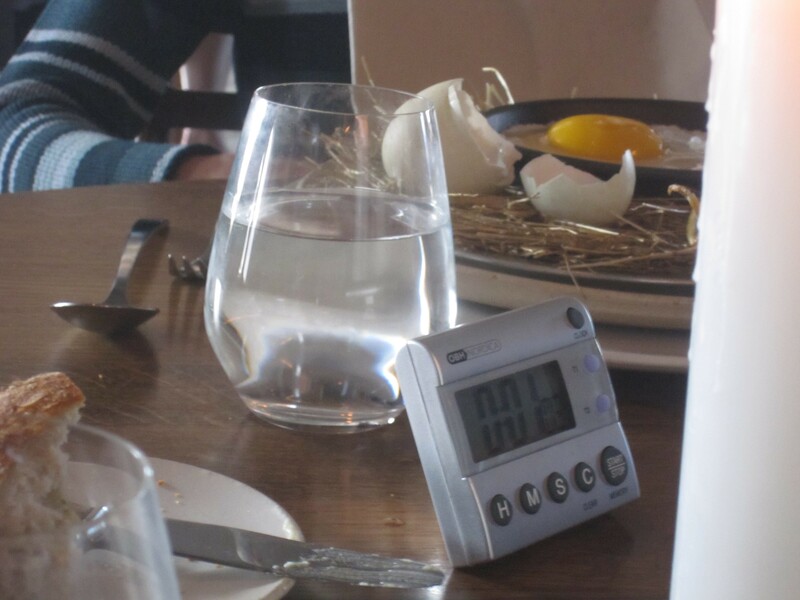 A timer on the table counts two minutes for the egg to cook. 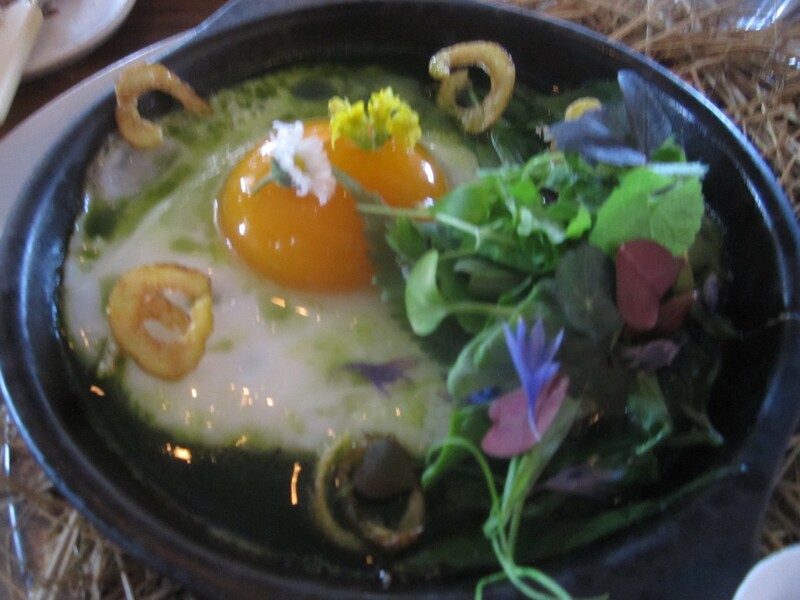 As the egg cooks, you add the greens meant to be wilted and cooked, then afterwards garnish with the flowers, herbs, and potato crisp squiggle. Finally, you mix it all up together for a fried egg-herb omelet through the eyes of a truly game-changing chef. This is not exactly the omelet they used to serve at Lutèce. Did I mention that the dish is fun too for the whole family? 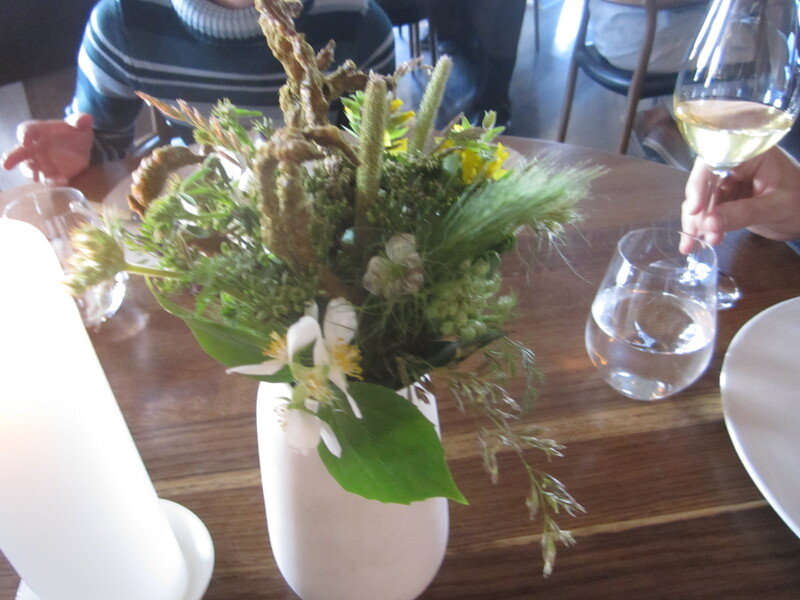 The highlight is trying to impress the Noma staff with your garnishing skills. Back to business, the only slightly too large (if possible?) serving came with the lamb sweetbreads, perfectly caramelized and as smooth as the chicken liver in the cookie snack earlier. Turnips and tiny button mushrooms with bitter greens similar to chard joined the sweetbreads, with a quenelle of herb butter and a flourish of a white flower. By now everyone was thinking I’m full, but I could do some dessert, or I’m full, I need to go for a walk soon. 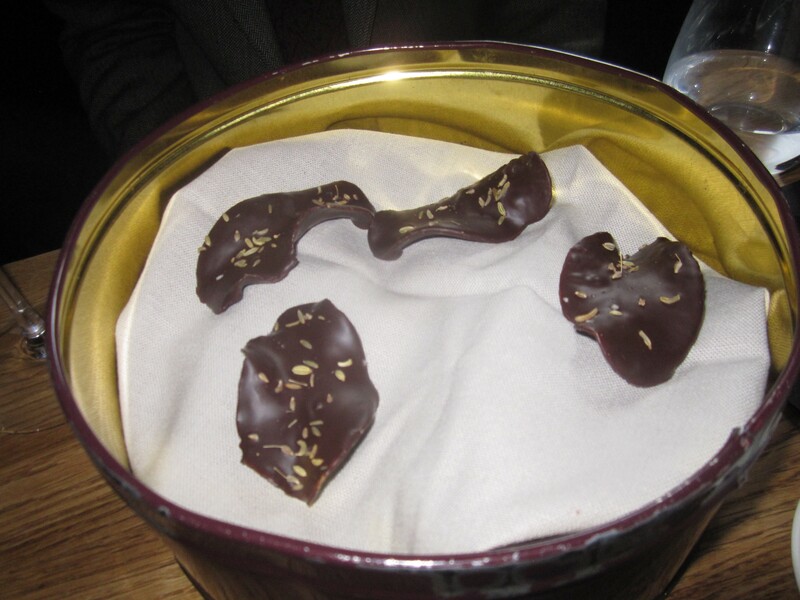 Wisely, the staff slowed the pace a bit more and after a pause delivered the cheese-dessert hybrid bridge course. The idea is perfect. A pool of rhubarb compote with milk curd, then a trio of finely diced, freeze-dried rhubarb, fresh rhubarb, and prickly tarragon, vibrantly colored alongside the pale milk curd. It looked almost like a country’s flag: red, purple, green, and white. Exceptional combinations here, with some crunch, sweet, bitter, and spice. The last, yes the last, plate was “Gammel Dansk,” a bitter Danish apertif that served as the base for the dessert. Our server showed us the bottle, making me think that he might do a Gammel Dansk flambé tableside next. That never happened. Instead the Gammel Dansk dessert with the liqueur broth featured sweet caramelized oats, milk meringue crisps dividing a bed of (more but a different type) wood sorrel, and a milk meringue cream. We had earlier met the wonderful pastry chef, Milton Abel, who had formerly been at The French Laundry and informed us he is about to return there soon, as we all talked about our love of home, the Bay Area. 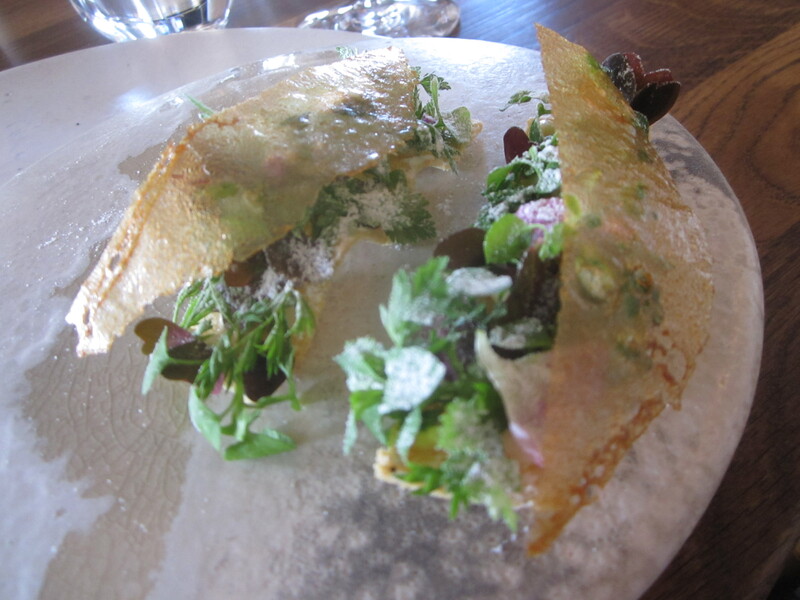 Go now to The French Laundry (harder for me to get a reservation at than Noma…) to sample this chef’s dessert talent and hope this Gammel Dansk stunner is served. Of course in the Bay Area, the dessert would have to be Fernet Branca. Dessert plates removed, the server informed us that was all that was planned for us this afternoon. Even though everyone certainly would not order a dessert at an à la carte restaurant, there was almost a sense of disappointment. That’s it? It’s been amazing, but…how can it end? 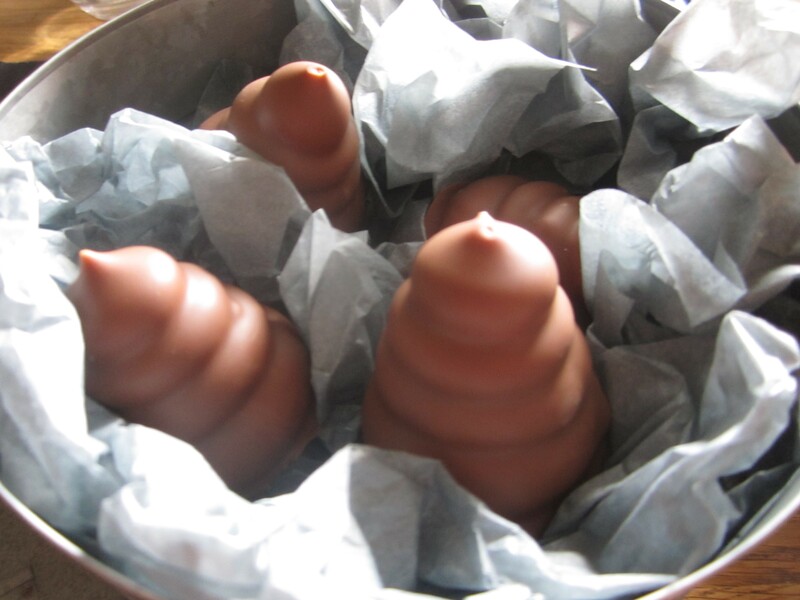 No chocolate? The procession of dishes leads diners into an eating hypnosis. You need exquisitely crafted bites every ten minutes or you get the shakes. Two minutes later with visions of massive credit card bills in your head, the server re-appeared and invited us to the separate bar area on the other side of the entrance where the party really was. I had thought all the diners departed when they left the main room. No, they just came here for petit fours and coffee. The celebration was palpable here, in this secret bar I didn’t know existed. Cookie tins held homemade potato chips covered in chocolate and anise seeds, a meringue marshmallow covered in chocolate that looked vaguely like a snowman, and luscious bone-marrow caramels in the bone that swept all other salted caramel flavors away and re-created the flavor. The coffee was wonderful, and insider comment, there is no espresso machine at Noma. No post-dinner lattes here. Instead, do what I did and continue the Noma theme with an espresso at Chef Redzepi’s favorite café nearby, Sweet Treat (the espresso is superior to the ristretto, but Redzepi prefers the ristretto…). Then go spend the evening at Tivoli Gardens to work off the meal. Interesting enough, perhaps because of the time spent at the table, the lightness and purity of each dish except the sweetbreads, and very few heavy sauces and meat involved, most of our party didn’t feel the need for a juice cleanse diet to start the next day. 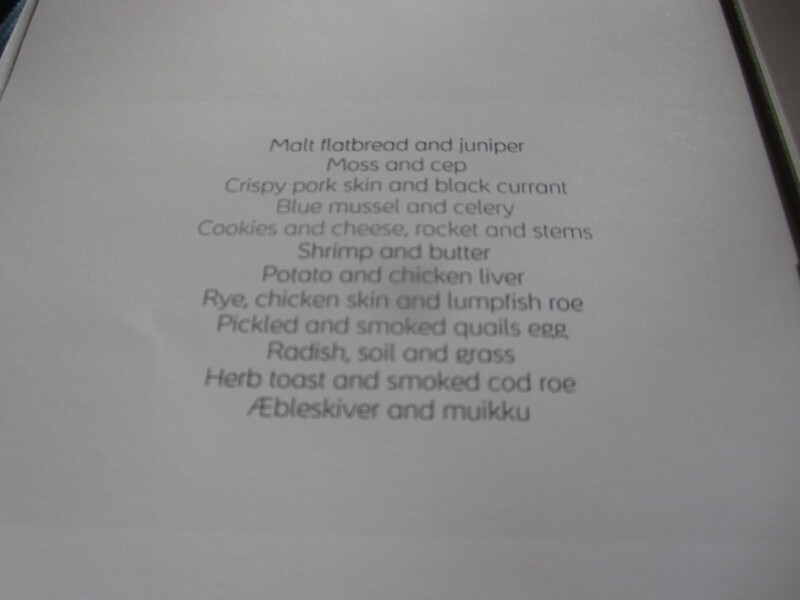 Great food is great food, and Noma knows how to pace it and overwhelm you without hitting you over the head. Now, in the spirit of honesty, a couple tiny faux pas did make an appearance. 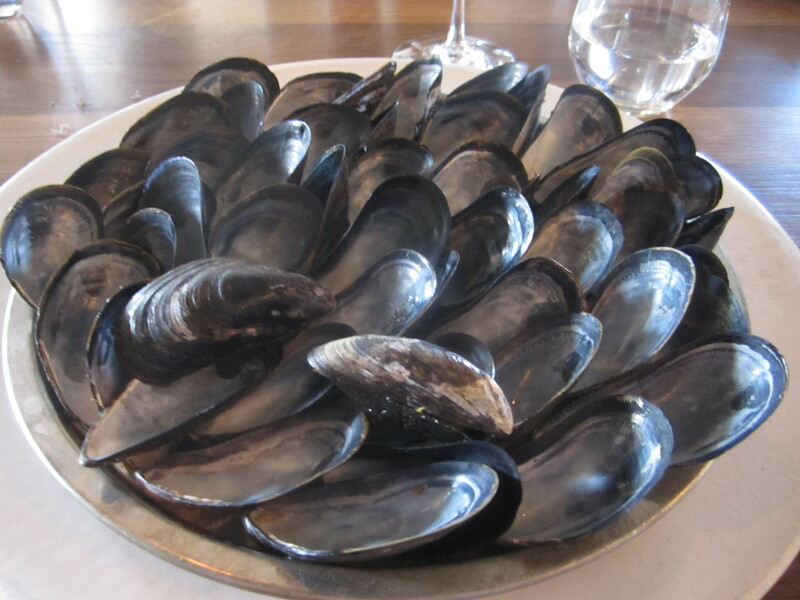 Every dish was stunning, but one of the “edible” mussel shells probably was not edible or was strangely crispy, causing one diner at the table to continue chewing the shell as if it were actually a mussel shell. Another time a diner left the table, and her napkin was taken away but never replaced until we mentioned the error. That’s it. Nobody’s perfect, but I think it’s fair to say that napkin mishap didn’t spoil anybody’s meal. It’s impossible to remember all the wines had, from a bottle of exceptional Sancerre to the spot-on dessert wine pairings. We opted for a mix of bottles to start, then pairings later with the heavier plates and sweets. With so many different tastes over all four hours, good luck being exact with wine pairings. One recommendation would be to start with some sparkling wine, move to a bottle of white for the mostly vegetable and seafood snacks and first part of the second half plates. Then swap to pairings because what matches with sweetbreads is not a match for fried egg or perch. Copenhagen probably has about 150 days of sun a year, and all June had been nothing but rain, I was told. Our day at Noma happened to have not a cloud in the sky. Obviously, we Californians brought the California weather to Denmark. 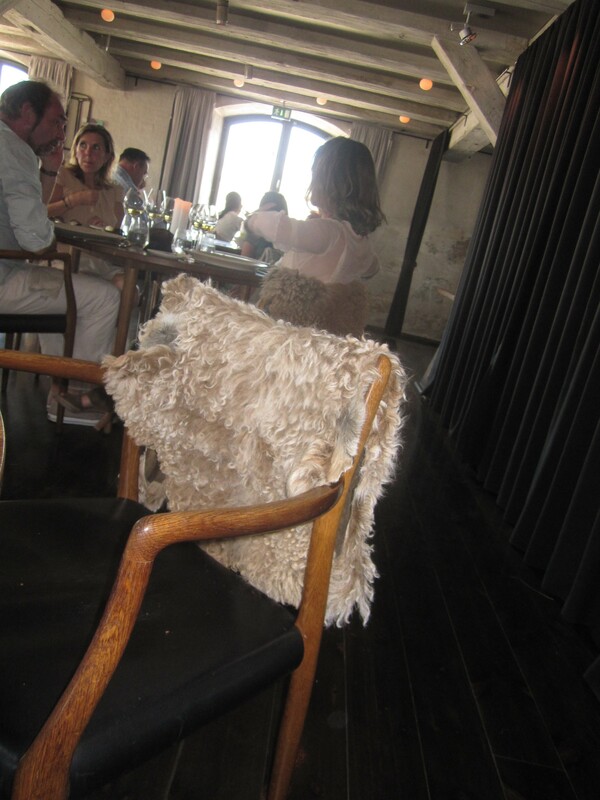 The sunshine made the primitive, barren, yet elegant wood and brick cellar that serves as the dining room for Noma seem even more mystical, the summer weather countered by the signature furry animal pelts that sit on the backs of many chairs. First kiss, graduation, marriage, winning the championship, returning to your favorite place—life’s great moments don’t need superlatives. From the first sight of the twin torches at Noma’s entrance on the cobblestone wharf to the bone marrow caramel, Noma was one of those life experiences you treasure forever. The company, the time, and the place, that’s what celebration meals are about. You cherish them forever. But now, may I direct your attention to the flowers in the center of the table…the journey continues. This entry was posted on August 13, 2012 by trevsbistro. 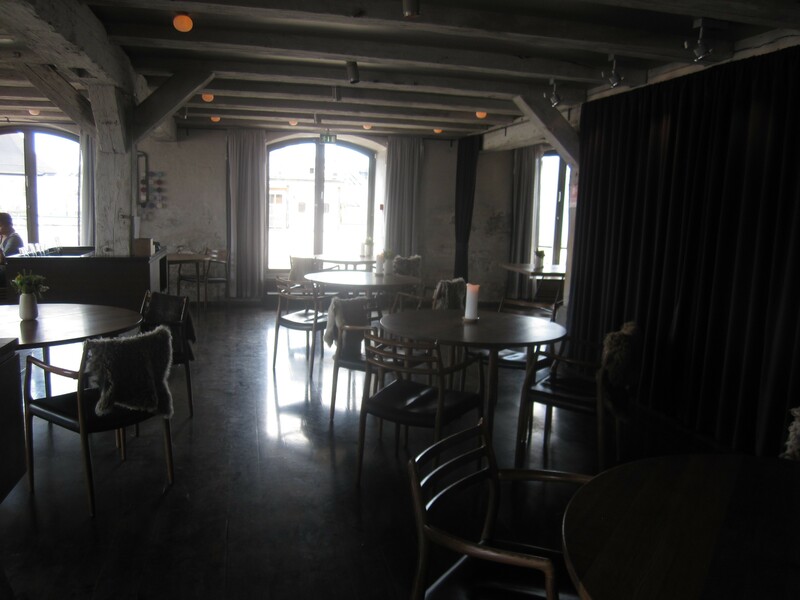 It was filed under Copenhagen, Restaurant Review .